Original Content: Time Management Tuesday: How About A Sabbatical? 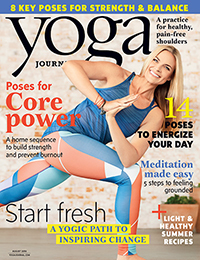 The August issue of Yoga Journal has a section on taking sabbaticals called Ready, Set, Stop. Being Yoga Journal, the section includes articles about three yoga instructors who took sabbaticals from teaching for various reasons. There are two additional articles on preparing for a sabbatical, both financially and in terms of expectations. Here at Original Content I am into curating information that can be applied to writing and time management for writing and then distributing it, no matter where I find said information. Material about sabbaticals definitely falls into the category of how writers can use their time. Why Would Writers Want A Sabbatical? Of course, we could be talking a need to get away from the pressure of working and submitting and working and submitting for a while, of rethinking your material and your career strategy. Unless you're an established writer generating a good income, taking that kind of sabbatical should be relatively easy on a practical level--you're not talking about cutting a necessary income stream. Otherwise, I'm thinking of two situations in which writers would be interested in taking time off. Writers doing work for hire and editing who want some time to work on their own writing. Writers with full-time day jobs who want some time to work on a writing project. As the Yoga Journal article points out, a sabbatical takes a lot of planning over a period of time because of the money involved. If you're talking about someone whose income supports a family, or even just contributes to supporting a family, it could mean having to save up a significant amount of money. Then for writers who are talking a working sabbatical, one in which they expect to write, another kind of planning needs to be done. A serious sabbatical probably calls for some intense goal and objective setting. Specific. You have a very specific writing goal/story/nonfiction project in mind. Don't, for instance, just plan to "write more." What does that even mean? Measurable. You have a plan for how much work you hope to get done on that writing goal. You can do the NaNoWriMo thing and set a word count, or decide on a number of chapters. Again, don't just plan to "write more." Define what "more" is. Achievable. You can actually reach this goal in the time you have, whether it's a first draft, a certain number of chapters, a certain number of words. If you can only take a few months off, you probably shouldn't get any ideas about learning a new language so you can write a book in Italian. Relevant. Whatever you're going to do should relate to the goal. Taking on volunteer work because you have some free time? Traveling to all the far-flung family members' homes? Only if the volunteer work and the travel relates to the writing goal. Time-Bound. Your sabbatical has an ending date, presumably. So the time-bound part should be easy. To be honest, sabbaticals are probably of interest to me, because my father-in-law was a college professor who left on a sabbatical leave a week or so after I got back from my honeymoon. So to me, this is something people really do with their time.